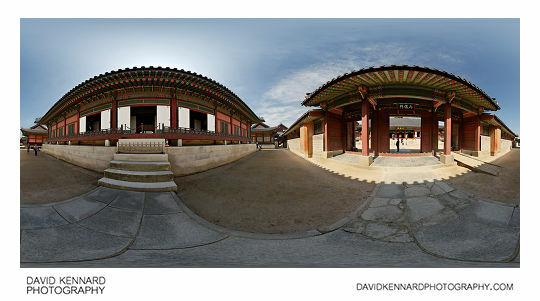 We walked through Sajeongmun Gate, which is located behind Geunjeongjeon, and I took a pano on the Sajeongjeon side of the gate. The people hanging around by the gate were a tour group of Chinese (if I remember correctly) tourists. Inside Sajeongjeon is another throne, though much less spectacular than the one in Geunjeongjeon. 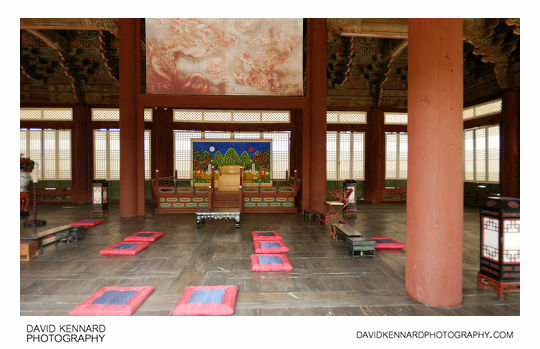 The King's throne would always have a painting behind it known as 'Irworobongdo' (일월오봉도). The King's throne is positioned in the center of the painting, to symbolize the King's position as the center of a balanced universe. There's a nice big dragon painting above the throne as well. 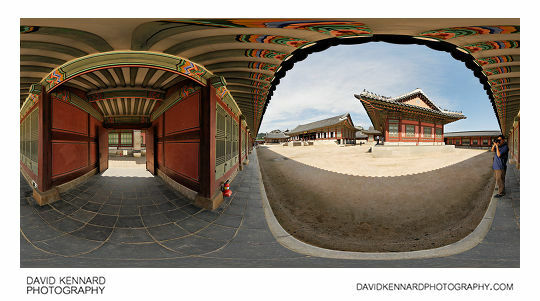 Sajeongjeon was used as the King's official quarters for handling state affairs. 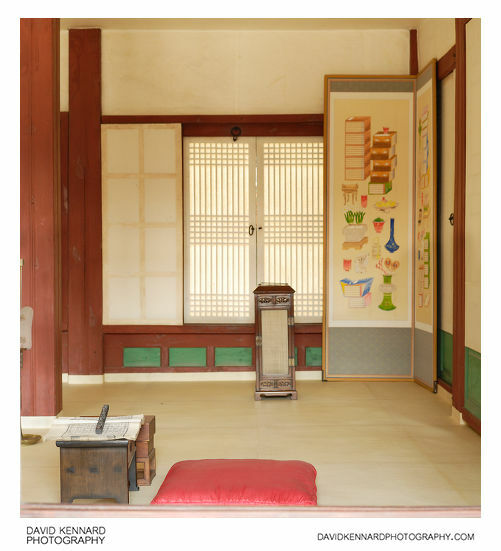 Sajeongjeon didn't have heated floors though, so in the winter the buildings to the left (Cheonchujeon) and right (Manchunjeon) were used instead. 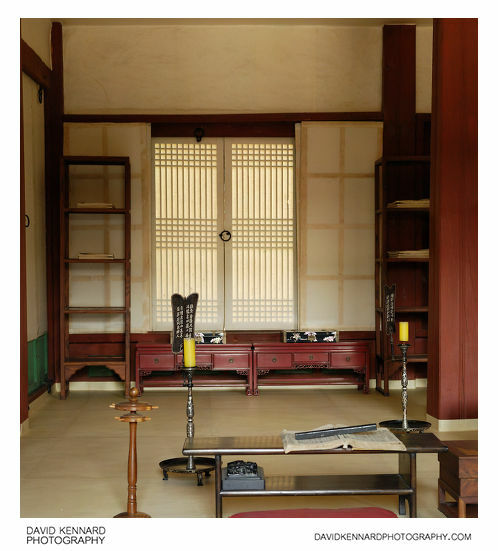 Originally they were connected to Sajeongjeon via corridors, but these were removed during the Japanese occupation and have not been rebuilt. 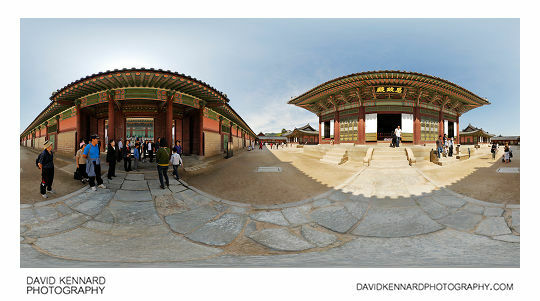 Gangnyeongjeon was the King's living quarters, and is one of the few buildings you can actually enter. 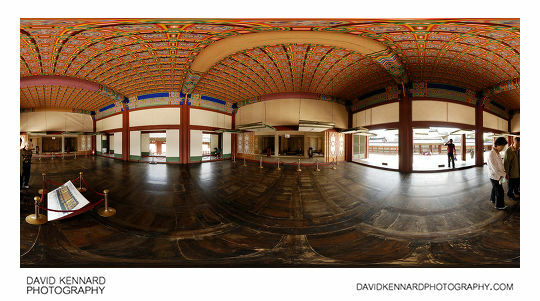 I took a pano inside, but didn't bracket my exposures enough to prevent outside the hall being blown out. I'm not sure it would have been possible to make a decent image with outside the hall being exposed properly anyway, it would be extremely difficult given the moving people coming into and leaving the hall.